YouTube uses a social media model where the social platform is the business. It’s a social networking site that centers around applying the ‘product’ or content made by the user (Youtuber) which creates a market through user generated content that is valuable to and attracts the end user (viewers). By enabling videos to pull large amounts of consumers, the brand is able to use advertising as a revenue source on channels and this income is used to pay the Youtuber’s, which in turn create the content and the medium for advertisements. With such a large application and univer sal access of user generated content, Youtube covers every walk of life with segmented categories such as entertainment, sports, music etc. available to the consumer as soon as they hit the homepage. There is no consumer purchasing on Youtube as it is a social networking community however, users can sign up for the Youtube Partner Program where content created by the users may be monetized depending on the size of the network channel and if their videos meet a specific criteria through a variety of ways including paid subscriptions, advertisements and merchandise. According to dailyrindblog (2014) Youtube tries to match ads that the viewer is most likely to watch and thus the more aligned the ad is to the demographic of the viewer the higher the click-through rate, the more Youtube charges the advertiser for the ads and hence the greater the value that content has. Youtube uses a combination of typical revenue models such as display advertising on site CPC (Pay-per-click), sponsorship and affiliate . Though with a high income revenue model Youtube still pays a huge bill for bandwidth usage, maintenance and security. The website is considered under the social media model whereby the customers can “drive the business using the social media culture through mobilizing customer engagement in a carefully structured way” (Chaffey & Smith, 2013 p.137). Youtube definitely has a high level of engagement which has lead to Youtube being the second largest search engine in the world with more than 800 million users. It also provides a platform for physical businesses to think of new opportunities venturing into the online environment and also for existing Internet based businesses for promotion. News.com.au is Australia’s number one News website in 2013 and 2014 with over 3.7 million accessing the site. They cover breaking news and national interest stories based in Australia and other News from different countries. News.com.au covers various segments including entertainment, travel, lifestyle, sport, business, technology, money and real estate, which covers a lot of content. News.com is considered to have a communications based Internet model whereby the flow of communications has become ‘like a web of communications between customers and opinion leaders – all built around the brand’ (Chaffey & Smith, 2013 p.137). The sender creates the News posts, and it shared by opinion leaders on various platforms such as Facebook for example, a person that is passionate about that specific category will share the post and this might be entertainment through to war related issues or even natural disasters. This then generates conversation, which then drives users back to the sender or News.com. With such a widespread cover of News topics and a simple domain name its no wonder News.com has so many people access and communicate their content. Chaffey, D & Smith, PR 2013, E-Marketing Excellence: Planning and Optimizing your Digital performance, 4th end, Butterworth Heinemann/Elsevier, USA, New York. Dailyrindblog (2012), ‘The Most Valuable Thing You Don’t Know About Youtube’s Business Model’, viewed 26 September 2014, http://www.dailyrindblog.com/youtube-value-business-model/. 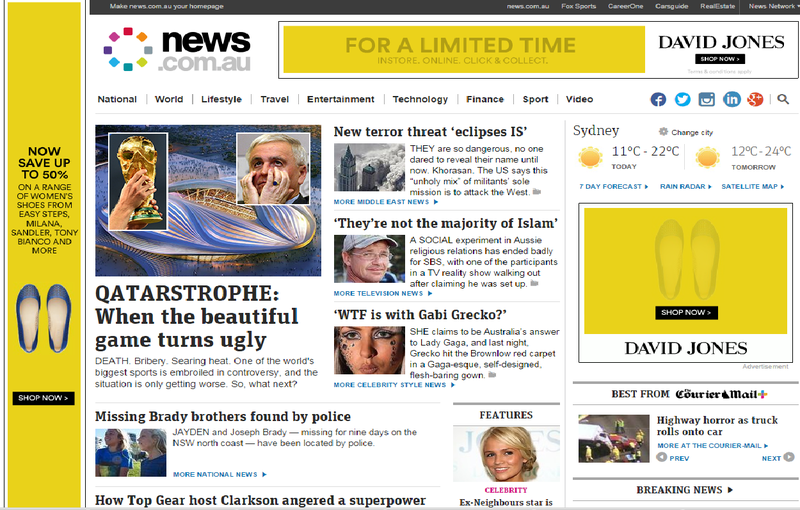 News.com (2014), viewed 26 September 2014, http://www.news.com.au/more-information. Youtube (2014), viewed 26 September 2014, Youtube.com.au. Scott Mclean (2014), Business Communication for Success v. 1.9, viewed 26 September 2014, http://catalog.flatworldknowledge.com/bookhub/reader/15?e=mclean-ch01_s02. This entry was posted in Business, Internet Marketing and tagged Business, Business Models, Communication, News.com, Social Media, Youtube on August 31, 2014 by crinkleccut2. Really interesting information here and was a pleasure to read and understand further. This has answered many questions for me. Haven’t heard of these two models before and thus it would a good read. It’s interesting how News.com works through the communication model being driven by opinion leaders. Blog post looks good too.